Newsted is Jason Newsted, of course, who use to be with Metallica. He also slapped bass for Flotsam and Jetsam, too, so the guy's got great street cred. This is a four song EP of some grooving heavy metal and when you realize that Jason is singing you might ask yourself, why didn't he ever front a song for Metallica? Well, I'm sure that will be answered in his eventually-to-be-released tell all book. The music on this EP is great. It's got a heavy metal sound and you might think that since Jason is the key name on the marquee that his bass would be the main instrument. You'd be wrong; all instruments work together to make this a great step to the full length disc "Heavy Metal Music." Jason's voice sounds like Lemmy on a few songs. He's got that raspy voice but he also has a smoother voice when he wants to sound melodic. Overall, "Metal" is a fresh sound and a great way for listeners to hear Jason front a band. 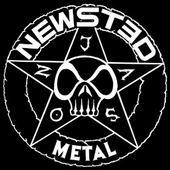 Newsted: Jason Newsted - lead vocals, bass, guitars; Jesus Mendez Jr. - drums, percussion; Jessie Farnsworth - bass, guitar, backing vocals. For more information, check out http://newstedheavymetal.com/. Revised: 02 May 2017 23:02:44 -0400.